There’s evil starches, then there’s good-for-you starches, from a modern-day health perspective. White potatoes are roundly shunned as one of those bad, rotten, festering ones of the bunch, bound to metastasize into a gummy tube of fat around your waistline. Refined white flours are bad, too, if you can even eat them without experiencing painful gluten intolerances! Now, I will never call either of these types of food “bad” entirely, but the bright side to these diet trends is discovering a world of satisfying whole grains and deeply pigmented potatoes that have been anointed their angelic, “good” siblings. I know a few people who are going Whole 30, and I was surprised to learn that the diet shuns starches completely—including beans. (At a dinner party where farro and mushroom risotto was served, one member was unable to touch it, hence my discovery.) I am clearly not an expert on Whole 30 and have no opinions on that. But there is so much starchy goodness out there, truly, that I decided to combine a few of them in one dish. Filler. That’s what we usually think of when it comes to starches, isn’t it? It helps stretch meat and protein, absorbing its yummy flavors, and sates your appetite efficiently, for better or for worse. While leaving out starches will leave you with lots of great and nutrient-dense veggies and proteins to eat in their place, this, experts have conceded, put into practice, can easily wind up in you consuming more fat, sodium and sugars than if you’d left starch in. And less fiber to boot. So I’d stick to no hard and fast rules, personally. And, what can I say? I have a soft spot for starches. 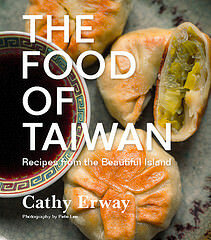 OK maybe my “soft spot” is my waistline but… hopefully we’ll meet a truce with more dishes like this one. I roasted up some sweet potatoes, which are usually just a bit too sweet for me to work as a generic starchy base, in big, meaty chunks. These are the icing on this salad, composed of otherwise neutral-tasting, “base”-appropriate stuff. Quinoa here, although you can swap in any whole grain (quinoa is technically a seed and not a grain, but you can and should still swap in farro, barley, bulgur, spelt berries, or whathaveyou grain). Then, chickpeas. Swap in any other bean as well. To season the dish, a bit of parsley is a great idea. Or lots of it. 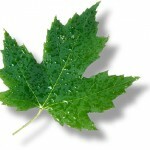 These leaves are one of the most densely packed superfoods out there (so you’ll see it squeezed at juice bars a lot). Like kale and collards, it has a ton of Vitamin K. Then, I sprinkled in some preserved lemon. If you didn’t make this a few months back, or have access to a jar from a grocery store, then forget it, and maybe just use a bit of fresh lemon zest and juice. This is pretty standard “grain salad formula” for me. But you can experiment endlessly with starches, beans, veggies and seasonings—maybe leaving out grains entirely and using just beans or legumes like lentils as the “base.” Adding cheese, like crumbled feta, adding fruit, and whatever’s in season. 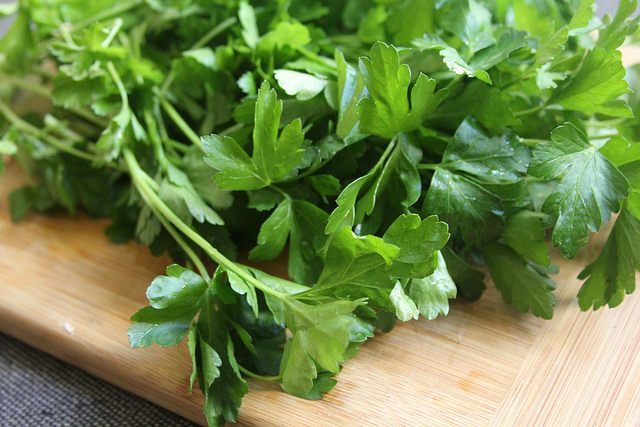 You can use lots of fresh herbs like parsley, to give it more green. And you can stuff it into vegetable vessels, too. No matter what combo, it’s the cheapest and often healthiest route to a filling meal that keeps for days. Yes, it’s time to make amends after holiday eating excesses. But you don’t have to give up on variety and flexibility—or starches—to eat well. Preheat oven to 375 degrees. Wash and dry the sweet potatoes. Chop into roughly 1” wedges or cubes. Toss with 2 tablespoons olive oil and a generous pinch of salt and pepper and spread across a baking pan, so that each piece is separate. Roast for about 15 minutes, then check on them and flip the pieces to brown the other sides evenly. Continue cooking another 10 minutes or so until the pieces are soft and slightly crisped on the edges. Let cool several minutes. Follow the directions on the package for cooking the quinoa. Let cool completely. 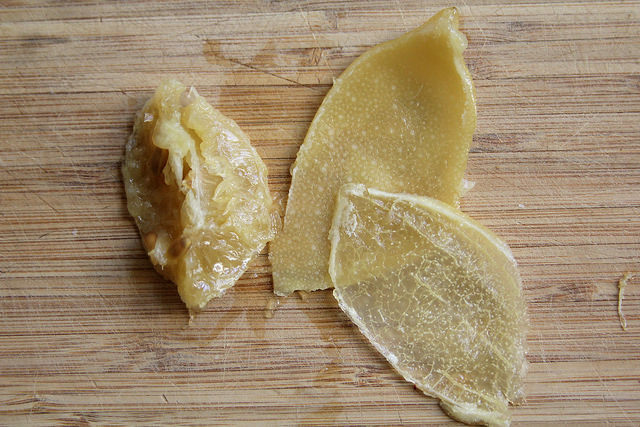 Place the preserved lemon skin side-down on a cutting board. Scrape away all the white pith so that there’s only just a thin sliver of yellow peel on the cutting board. Cut the yellow peel into thin slivers. Combine the cooked and cooled quinoa with the chickpeas, preserved lemon and parsley, and season with salt, pepper, and extra olive oil to taste. Finally, toss in the sweet potatoes and serve. Four brownie points: This dish is great for you. 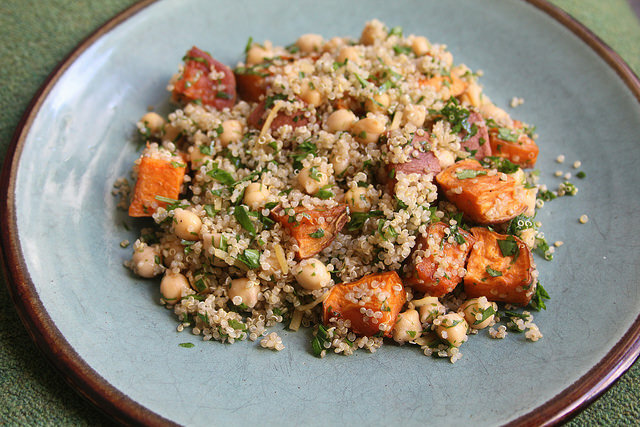 There is plenty of protein from both the chickpeas and quinoa, which will give you the added bonus of fiber and no cholesterol. 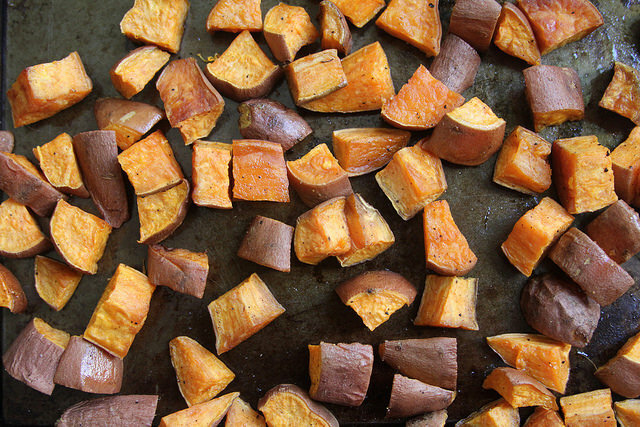 The sweet potatoes, while caloric, are high in vitamins and minerals—especially with their tasty, crispy skins left on. Keep winter colds away with their antioxidants. And the parsley is chock full of leafy green nutrients, like Vitamin K and Vitamin C. The whole thing is bathed in heart-healthy olive oil and is totally vegantastic. Eight maple leaves: Stock up your pantry with staples this winter—you’ll want to be able to churn out healthy meals like this all the time. 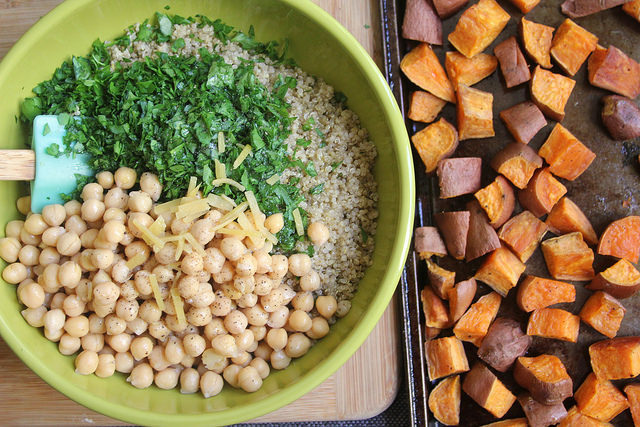 Quinoa is much quicker to cook than most whole grains, so that’s a good one for weeknights. Sweet potatoes keep well in the kitchen, too. And if you don’t like preserved lemons, pick up some more olives or capers for that punch of pungency instead. Eating all plant-based meals like this one is good for you and the environment—and your wallet, as you’ll notice, too. i really love this food. I love potato and quinoa. People who wants to play Board game then come with me at this platform and play one of the most wonderful and so entertaining Mind game for free of charges and online any time any where. I didn’t have any preserved lemon, so I mixed in some fresh lemon juice and olive tapenade from the far back reaches of the cabinet and it is STELLAR. Thanks for this recipe!